The brant is a small, stocky goose with mostly black and dark brown plumage. It can be easily identified by its white patterned neck collar (which is broken in the middle in the eastern subspecies). Its head, neck, and chest and black; its back is dark brown; and the area under its short, black — and barely visible — tail is white. The shade of its belly and sides varies between subspecies, with western birds exhibiting darker undersides than eastern. The brant flies with short, fast wingbeats. The brant makes a rolling, throaty crrrrk call. Click here to listen. 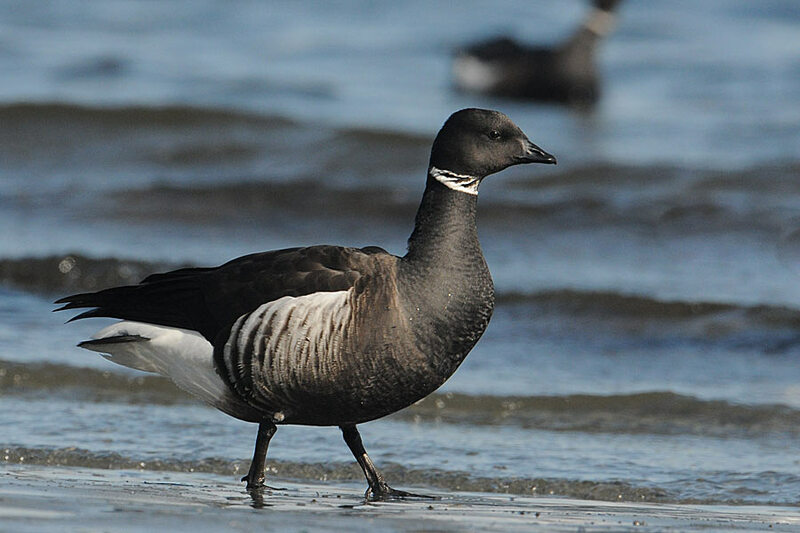 The brant is a sea goose, mostly inhabiting coastal bays and estuaries when not nesting on wet coastal arctic tundra in the summer. It may also forage in open grassy areas right next to the intertidal zone. Eastern birds may stop over at interior freshwater lakes during migration. This species is found along the Central Coast during spring and fall migration. Its winter range extends from northern Mexico to southern Vancouver Island; it also winters on parts of Haida Gwaii and the Aleutian Islands. 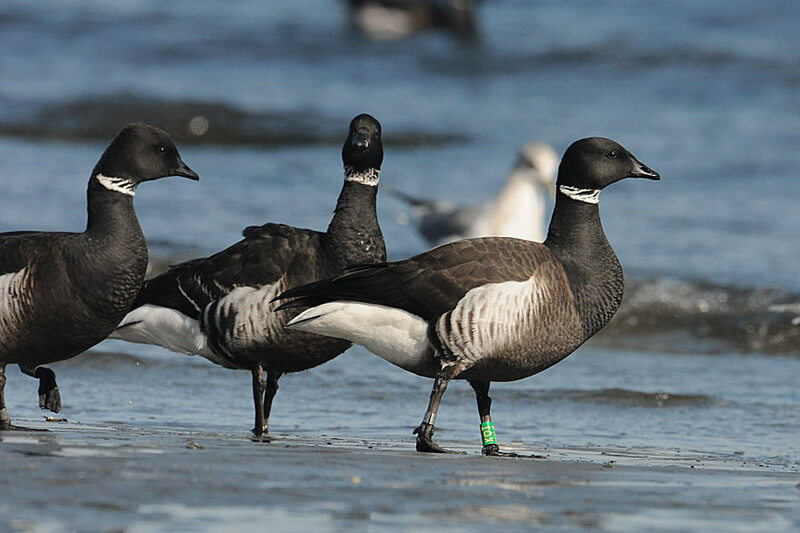 ​The brant is smaller and darker overall than the longer-necked Canada goose (Branta canadensis), which has a white check patch and a strong contrast between its black neck and its lighter chest and back. It is found year-round on the BC coast. The cackling goose (Branta hutchinsii) is similar in size to the brant, but looks like the Canada goose. The brant feeds on eelgrass when it can, but otherwise will feed on other aquatic plants, green seaweed, grasses, and some invertebrates. It also feeds on herring roe during spawn events at habitual stopover spots during the spring migration. Brant. The Birds of North America Online (A. Poole, Ed.). Ithaca: Cornell Lab of Ornithology; Retrieved from the Birds of North America Online. Accessed 03/06/2016. Brant Branta bernicla. Audubon Birds. National Audubon Society. Accessed 03/06/2016. Dunn, J. L. and Alderfer, J. (Eds.). (2011). National Geographic Field Guide to the Birds of North America. (6th Ed.). Washington, D.C.: National Geographic Society. Pp. 18-19. Fenneman, J. Branta bernicla (Linnaeus). In Klinkenberg, Brian. (Ed.) E-Fauna BC: Electronic Atlas of the Fauna of British Columbia. Lab for Advanced Spatial Analysis, Department of Geography, University of British Columbia, Vancouver. Accessed 03/06/2016.